This past Sunday morning I attended the service at the Rime Buddhist Center (Rime is pronounced ree-may). I should say, however, that this was not my first visit. In fact, the Rime Center has been my spiritual home for nearly three years. Over the next few months I will visit a great number of houses of worship and prayer, sacred spaces and places from a wide array of religious traditions. It seemed fitting that my journey should begin from home. Nestled in the shade of the elevated section of I-35, in the western edge of the Crossroads Arts District, the Rime Center finds its home in a hundred-year-old church. On any given Sunday morning, you will find people of all ages walking up the steep stairs for the 10:30 service. The Rime Center offers a full schedule of classes, noontime meditation, and other practices throughout the week; but Sunday mornings draw the biggest attendance. Upon walking through the main doors, an altar with dozens of votive candles, incense and a photograph of His Holiness, The Dalai Lama welcomes attendees. The Rime Center is a non-sectarian Buddhist community in the Tibetan tradition, of which the Dalai Lama is the highest-ranking teacher and spiritual leader. As you make your way down the foyer, you will see shoes neatly shelved and arranged off to the side on the floor. This will be your cue to remove your own shoes and add them to the collection. Don’t worry, you’ll get them back! As you come into what would’ve been the nave of the church, you will find yourself in the main shrine room. This is a big, open space with rows of cushions tidily arranged on the floor. There are also chairs lined along the sides and the back for those who prefer them for comfort or health reasons. The shrine is at the front. 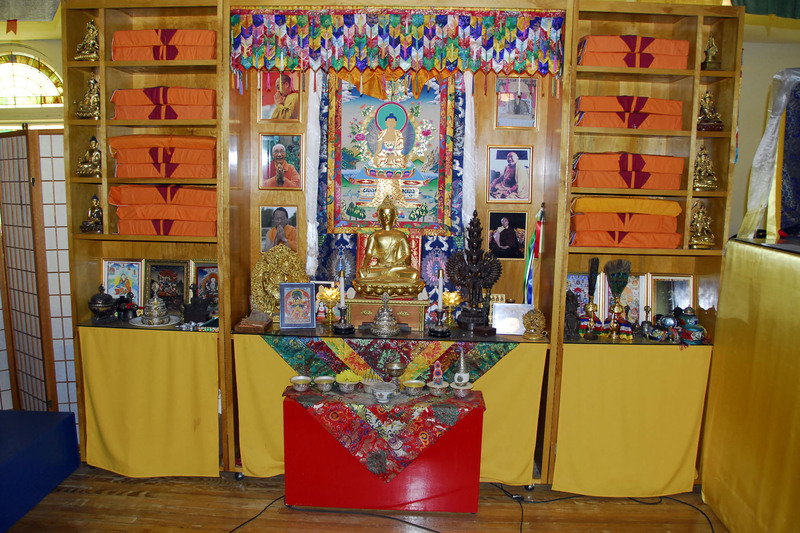 It houses photographs of His Holiness as well as other prominent teachers; there are sacred texts, offerings of water, rice, flowers and incense. The centerpiece is a gilded statue of the Buddha. 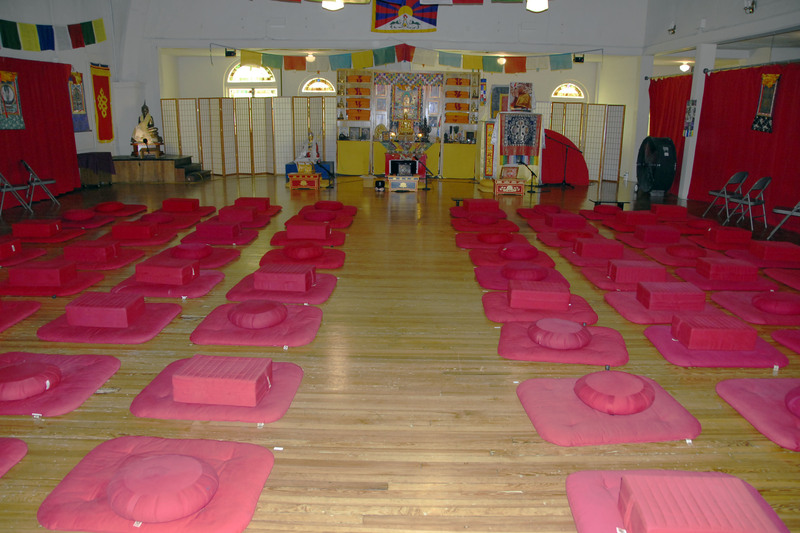 A few feet below and in front of the Buddha is the teacher’s seat, slightly elevated off the floor. At the sound of drums and horns, the congregation stands. Lama Chuck Stanford (the center’s spiritual director), followed by two preceptors, walks in from the back of the room toward the shrine. Following prostrations and lighting of incense, he sits and then everyone else sits. The service begins with a few minutes of silent, centering meditation. For the next forty minutes or so, the Sangha (the Buddhist term for community) recite prayers, chant mantras and sit three separate ten-minute periods of meditation. The service concludes with a Dharma talk, and a few closing prayers. At the sound of drums and horns, the preceptors make their exiting procession and the service concludes. A view of the main shrine room. What you find in the Rime Center is a unique Buddhist experience. The entire order of service is provided in a bulletin, making it easy for seasoned practitioners and newcomers to follow along. Explanations and translations (some of the prayers and mantras are spoken in Tibetan) for every aspect of the service are found in the sidebars, one need not feel lost or confused. Toward the end of the service, announcements for upcoming classes and programs are made. During this time, the center preceptor will welcome visitors and invite them to introduce themselves. Lama Chuck makes a point to say it is his goal for the Rime Center to be the most welcoming spiritual community in Kansas City, and you certainly feel that this is a genuine sentiment. Congregants mingle and linger following the service, some visit the bookstore, while others have tea. If you’ve ever wondered about Buddhism or meditation, the Rime Center is a great place to learn. For those of us raised in a Western religion, experiencing Eastern practices can be a little intimidating at first. But the Rime Center’s service includes enough familiar elements that one shouldn’t feel like a complete stranger in a foreign land (children have Dharma School during the service, and it’s okay if you slip up and call it Sunday School, I often do). The people are warm and friendly. For those with a bit more experience, it is a wonderful place to deepen your practice attending retreats and teachings by many of the visiting teachers. So, there you have it, my first installment in this PLACES section of the blog. Questions? Feedback? Let me know in the comments section. DRESS: Dress is modest but casual. Bear in mind you will most likely sit cross-legged on the floor; you’ll want to dress comfortably as most congregants do. Remember you’ll be leaving your shoes in the foyer. CHILDCARE: The Rime Center has childcare for infants and toddlers as well as Dharma School for children ages 4 and up. PARKING: There is ample parking on the street. TIME: Sunday services begin promptly at 10:30, you will want to arrive at least five to ten minutes early (earlier if bringing children) and find a cushion. Service is usually over a little bit before noon. ← You are the other and the other is me.